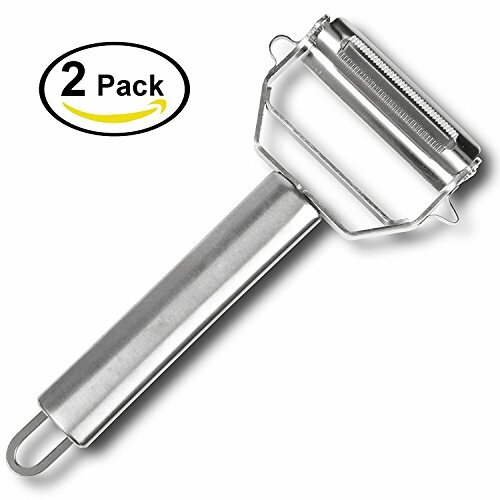 COMFORTABLE TO USE & BUILT TO LAST Deiss julienne & vegetable peeler set is built from best quality stainless steel that won\'t rust and will last for years to come. Comfortable non-slip handle provides firm grip even if your hands are wet or oily. Soft coating takes the pressure off your hand, so you won\'t get tired while peeling. IMPROVE YOUR COOKING WITH ENDLESS DISH OPPORTUNITIES Amaze your friends with new, restaurant-like recipes and make your everyday cooking entertaining. Decorating your dishes with delicious-looking garnishes, making zucchini noodles, cutting vegetables and fruit for healthy salads, slicing potato fries and cheese, removing skin from the apple or even orange - it\'s so easy with our Deiss julienne & vegetable peeler. ENJOY fresh, healthy and raw dishes and salads, along with easy, pleasant, comfortable and smooth food making. COMPACT & DISHWASHER SAFE Save space in the kitchen by replacing bulky and hard-to-clean utensils with a single Deiss peeler. It easily fits into any drawer or can be hung using the loop on the handle. To wash the peeler just pass it under running water. It\'s also dishwasher safe. STAINLESS STEEL & DISHWASHER SAFE: UberChef uses a high quality stainless steel that presents as a beautiful brushed metal. Not only do your culinary skills get a boost, but so does your kitchen decor. SURPRISE yourself, your family and friends - usual food prepared in a different way - peel and julienne the vegetables, and prepare healthy zucchini noodles!